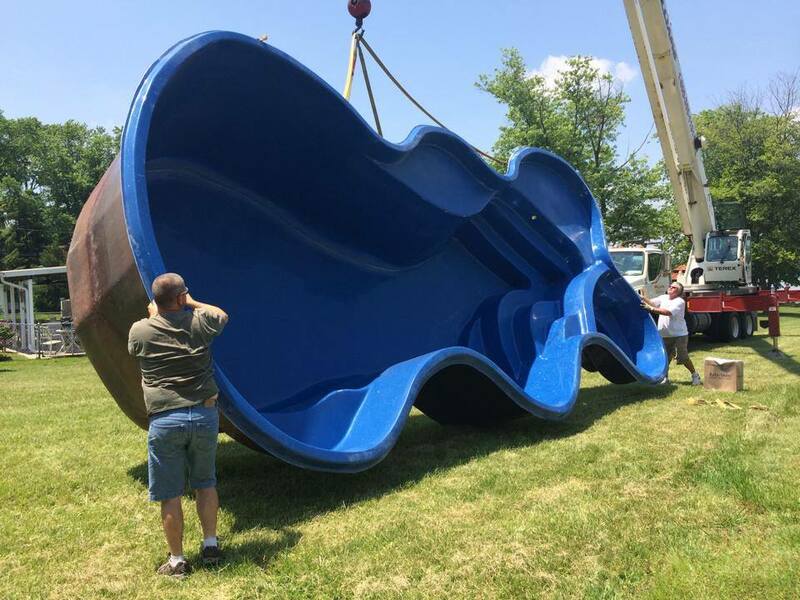 Woodfield offers complete design and installation of all kinds of new pools – from concrete, to fiberglass, to vinyl liners. We custom build each pool and outdoor project. 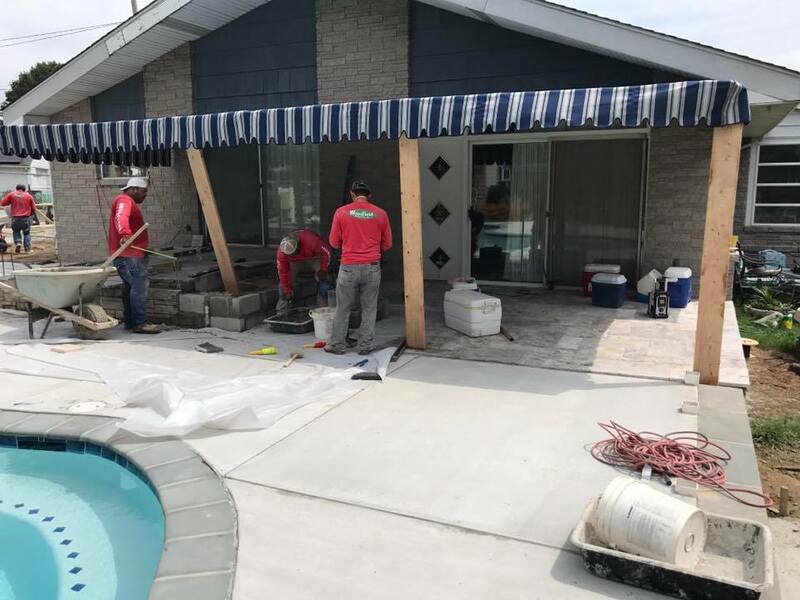 Along with full custom pool design, we also do pool renovations, including but not limited to concrete repair, tile coping, or sun shelf and pool deck installations. If you are ready to revive your entire outdoor living space, we can help you achieve your dream. Woodfield only installs high quality Pentair pumps, filters, heaters, and salt systems as we are authorized installers of their products. A complete Pentair pool system comes with a three year warranty. Woodfield is a San Juan Pool Dealership Authorized Installer. We would be happy to assist you with all of your pool-related needs and concerns. 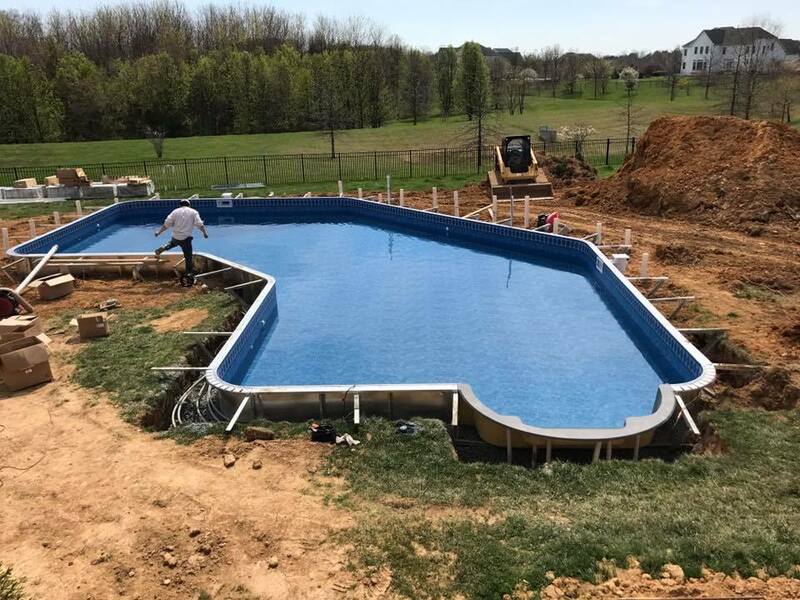 There are a number of options for pool materials that work well for outdoor applications in Maryland and Delaware, including vinyl, fiberglass, and concrete. Woodfield will work with you to determine which materials work best to achieve the design for your outdoor space. Each material type has its benefits. Concrete offers a strong and long-lasting pool with endless design possibilities. 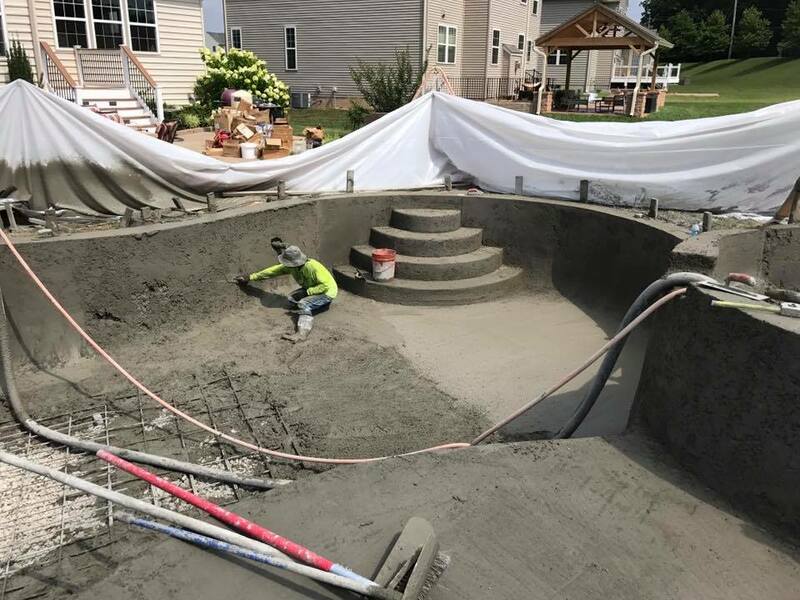 Woodfield pool installation crews are adept at working with the two types of concrete mixes best suited for in-ground pool installation. 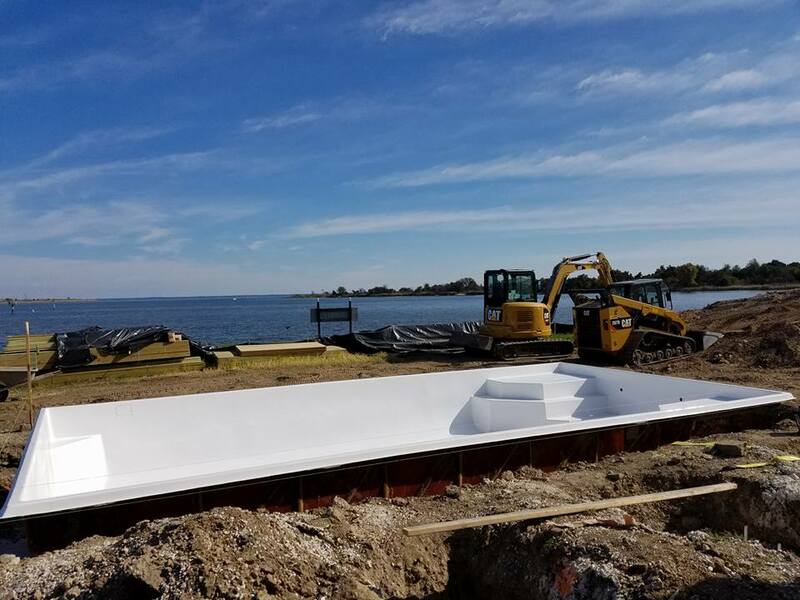 Since both shotcrete and gunite are long-lasting, deciding which material will work best for a particular swimming pool installation depends largely on the design and shape of the pool itself. A gunite pool is an in-ground pool shell formed by spraying a dry cement mixture at a high velocity and pressure. It is then manually mixing it with water via the installer. A shotcrete pool is an in-ground pool shell formed by spraying a premixed combination of cement and water. All types of concrete — whether cast-in-place, gunite, or shotcrete — can produce long-lasting pool shells if expertly installed. Using one technique at the exclusion of the others may subtract from the benefits of all three processes, and expert pool builders agree that there is a place for all methods at certain stages in the pool construction process. 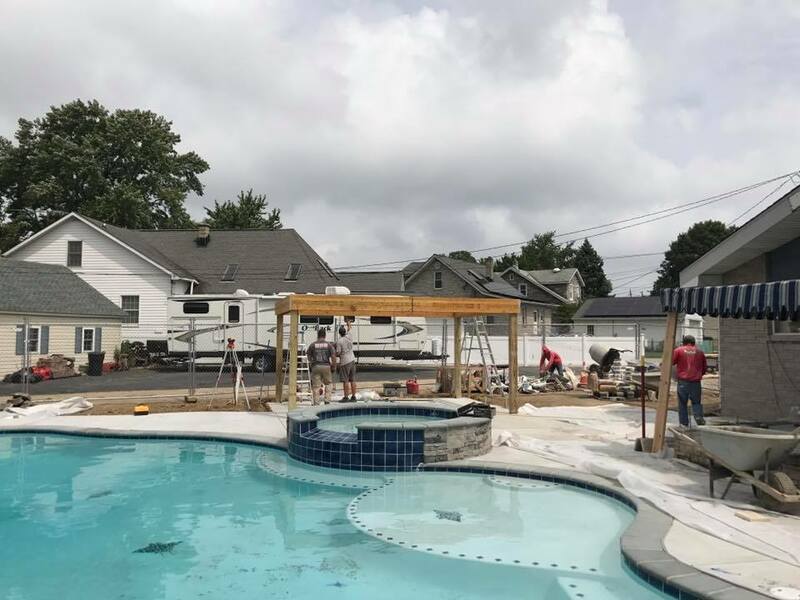 Consultation with a Woodfield Outdoors design team member, who will work with you to integrate a concrete pool into your existing landscape or include it as part of a larger outdoor living space, which could include a patio, outdoor kitchen, or fireplace. Careful measurement and excavation of your space by our trusted Woodfield crews. Installation of adequate plumbing as determined by your project’s specific needs. 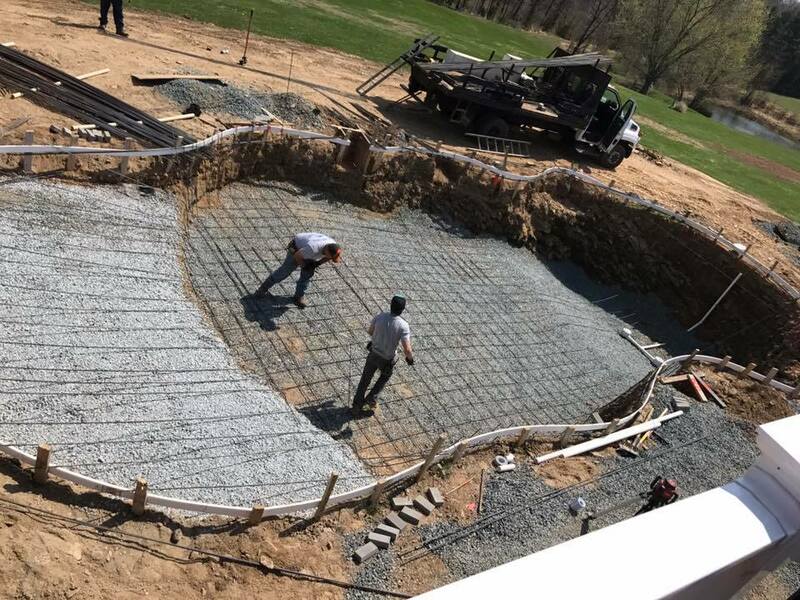 Woodfield crew members then install a reinforced cage of 3/8” steel rebars into the site excavated for the concrete pool, placing them at a distance of ten inches and securing the reinforcement with a wire. 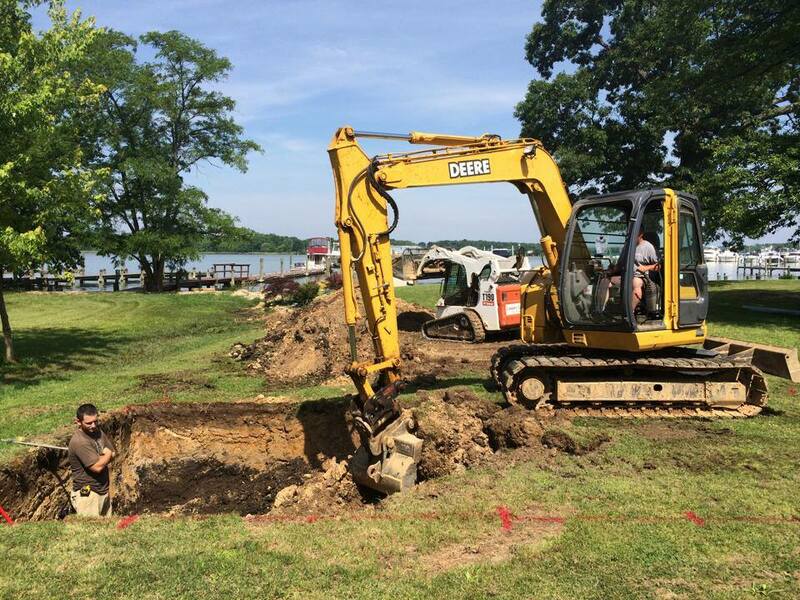 Next our dedicated crew will begin the application of concrete – either gunite or shotcrete – onto the reinforcement. We apply both in a similar fashion, using a compressed air and spray mechanism. In gunite application, the cement and water do not mix completely until the spray hits the surface, so having trusted operators performing this critical step is crucial to ensuring an exceptional final product. We blast compressed air over the surface for compaction of the material once application is complete of either gunite or shotcrete. Woodfield crews manually level the surface using a trowel afterwards. The pool cures for a week, after which we apply a finish on the concrete. This may be plaster, paint, or fixing tiles. We are authorized pool builders for Pebble Technology Pool Finishes which add a custom touch to your new concrete pool. 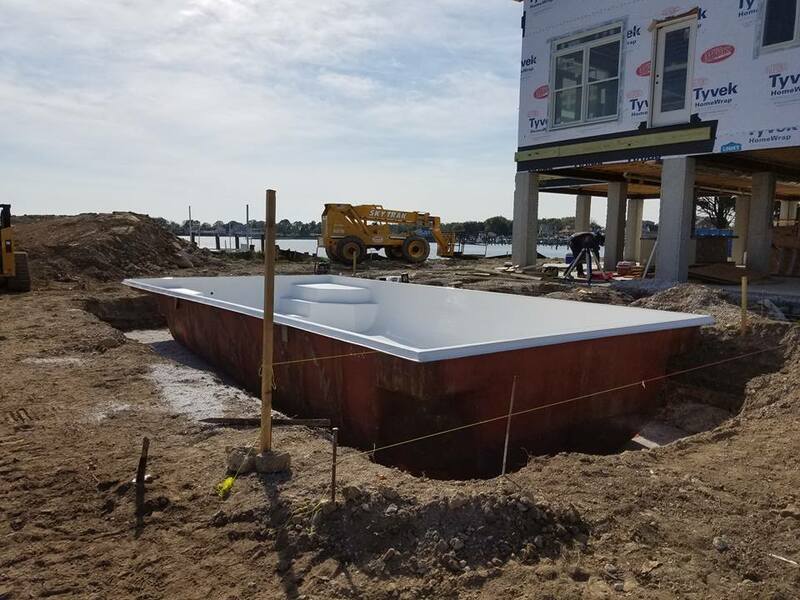 The pool is now complete and ready to be filled and enjoyed as part of your backyard living space for many seasons to come. In partnership with San Juan pools, we offer over 65 different styles and sizes to suit every need or preference. A leader in manufacturing fiberglass pools since 1958, San Juan is in a league of their own when it comes to quality and value. San Juan offers a 25 year structural warranty on their products*. Their low maintenance pools are non-porous and resistant to algae along with other undesirable elements. Even more, this translates into less mechanical and chemical maintenance compared with concrete or vinyl liner pools. San Juan fiberglass pools never need resurfacing. Additionally, you can customize them with ceramic tile, deck jets, and creative decking styles, including spillover spas and waterfalls. We design and install concrete, vinyl and fiberglass. Our pool builders can also recommend the latest in Pentair Pool Product technology, including energy-saving solutions involving the addition of high-tech pumps, filters, heaters, cleaners, lighting, and more. Our state of the art equipment is engineered to work hard so you don’t have to. Only trained Woodfield personnel complete our fiberglass pool installations. When you work with Woodfield, you deal with one person, not a string of different subcontractors. 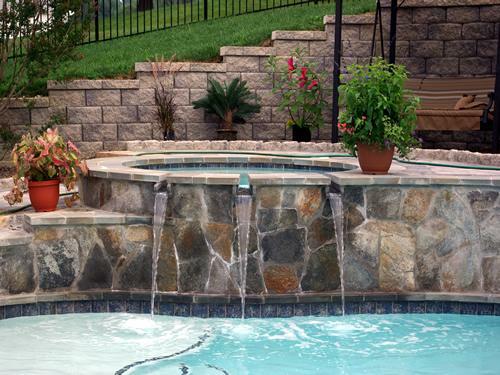 And unlike most pool contractors and builders, our professional, skilled landscape designers will work with you to develop a complete backyard paradise including patios, waterfalls, and gardens. As with every aspect of our business, our customer service is second to none. We offer a full warrantee on all our work and we’ll be on site from the day your pool arrives to the day your job is done. Some companies limit their “lifetime warranties” to 7 years in most jurisdictions. San Juan Pools actually offers a 25 year structural warranty.